As much as I believe in Ayurveda (a natural form of medicine that originated from India), I am not one who could read books on it for long without losing the plot. Until I viewed Your Irresistible Life, hot off the press in October. 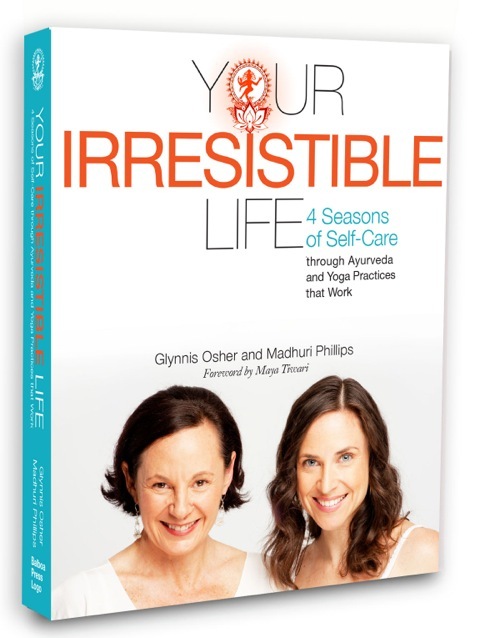 Vancouver-based Ayurvedic practitioners Madhuri Philips and Glynnis Osher have made this book so accessible, relevant and interactive that I cannot wait to get the hard cover version and dive into it page for page. Ayurveda is derived from two roots: Ayu, meaning life; and Veda, which means knowledge. The knowledge of life, the science of life, is Ayurveda. Today, we associate Ayurveda with India and it can get confusing because some people think they have to eat Indian food or wear traditional Indian clothing to practice Ayurveda. Not so. Ayurveda is an inclusive healing modality. It is the mother of all medicine, and, at its essence, it understands everything through the lens of the five elements theory. In India, this art and science has been developed, notated, and systemized for over 5,000 years. By observing nature, we realize we are nature: We are not separate. The five elements: earth, water, fire, air, and ether make up everything on this planet, including you and I. We are all beautiful expressions of a unique alchemical combination of these five elements in distinct form. No two people have the exact same ratio of earth, water, fire, air, and ether. What is a dosha and how does knowing our dosha type help with self-care? Your distinctive make-up is called your dosha, or constitution. Your dosha is an expression of your physical, mental, emotional, and energetic make up. At the moment of conception, your true nature is established: It is the blueprint, the ratio of the five elements that make up your dosha. The five elements make up the three Ayurvedic doshas: vata, pitta, and kapha. When you understand your dosha you will then have the foundation for learning what foods, routines, lifestyle practices, yoga, and meditation will be best suited to bring you into balance and prevent disease from occurring. You’ve included yoga practices in your book. How do Ayurveda and Yoga work together? Traditionally, Ayurveda took care of the physical body while Yoga was the path to self-realization. They are two sides of the same coin. You cannot have one without the other. The physical aspect of Yoga is the tip of the iceberg, but let us not ignore the depth and immensity of what exists below the surface. The yoga asanas (postures) are designed to keep you healthy by benefiting all of the systems of the body. The nervous system, digestive system, circulatory system, reproductive system, and so on, are all strengthened when doing the specific practices appropriate for you. This is all true and yet, there is so much more to both Yoga and Ayurveda. They are one and the same — a whole system created for remembering wholeness. How can we prioritize our self-care and still live full lives? Simplify. Start with one or two changes. We would recommend scrapping your tongue every morning and then having a glass of warm water with a squeeze of lemon. Our book is full of suggestions and practices. Go at your own pace and integrate what feels good to you at the time. Let your self-care practices support your life, not take away from living.